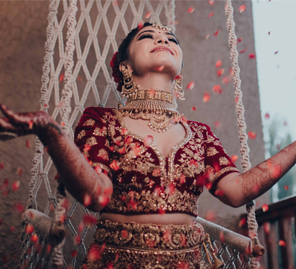 Gauri picked striking ensembles for her wedding functions that were pretty yet practical, especially her wedding lehenga. A range of primary colors such as pink, blue, yellow and green alongside classy designer picks enabled bride Gauri to look distinctive at each function during her wedding. "Looking back, that first meeting seems like a lifetime ago. It was just another day at work and little did I know that the ‘new boy in office’ would be the reason for my smile very soon. My husband Anshuman was friends with one of my friends at work and eventually hanging out after office in Gurgaon became something we both would look forward to. There was a strong spark between us, and soon we were spending most of our time together. Even with different interests - he loves FIFA, and I don’t understand the game, I love clothes, and he couldn’t care less - we realized that we have the same views on a lot of things. He always knew how to go the extra mile (in this case, literally) to make me feel special. I was visiting my home (Moradabad) for my birthday, and when I woke up, he was right beside me with the most delicious breakfast in bed (which he cooked himself). He had driven all the way, leaving from New Delhi in the wee hours of the morning so that he could reach Moradabad before I woke up. It was the best surprise, followed by a beautiful proposal." "Our sagan that marked the beginning of the celebrations was an intimate affair. I opted for a pink lehenga by Anushree Reddy. I like her work, and I knew that one of my wedding outfits had to be designed by her. The one that I bought was ideal for a smaller function. The blouse had a sheer fabric that went all the way up till the neck, so I decided to wear large statement earrings that would help elevate the look without clashing with the ensemble. 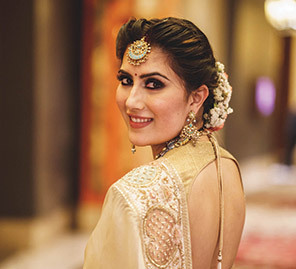 Makeup by Shagun gave me an understated look to go with the soft color palette I had chosen for this event." "My mehndi outfit was designed by Abhinav Mishra. He is a friend, so it was a given that one of my outfits would be designed by him. I would not have had it any other way. He designed a gorgeous green lehenga covered with intricate mirror work and paired it with a pink blouse. Not only did the color combination stand out, but the outfit made me feel so pretty! With this, I wore a diamond and ruby necklace with matching earrings." For this function, it was Makeup by SP Eastland who gave me a flawlessly light look for the day function as a heavy look would have looked jarring." "My look for the sangeet was curated by my mother-in-law. I wore a blue lehenga that was created by a designer in Jaipur. It was covered in intricate gold thread embroidery. To go with it, I wore a kundan necklace embellished with pearls and emeralds. Joynie was my makeup artist for this event, and she gave me bold smokey eyes keeping in mind the deep color of my attire. She let the rest of the makeup be very fresh to balance out my entire look." "I wanted my look for haldi to be very simple since this was a small function. I wore one of my mother’s saree that was trimmed with a golden border and matched it with a yellow blouse. 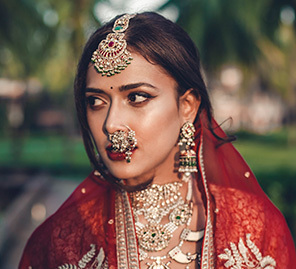 I wore a few pieces of floral jewellery and did my makeup for this ceremony." "While a lot of girls look forward to wearing red on their wedding day, I was very clear that that was not the color for me. I wanted an outfit that I could reuse even after my wedding - maybe by pairing the lehenga with a lighter blouse or a different dupatta. I decided that I would wear pink, but which shade it would be got clear only when I saw the Anita Dongre creation that I picked. I was very careful about selecting a design that was relatively exclusive, and I wouldn’t find 20-odd brides wearing the same thing. To go with my outfit, I wore traditional kundan jewellery. I think that goes best with a gotta patti work that has such an Indian feel to it. Jasmeet Kapany was my makeup artist for this function. 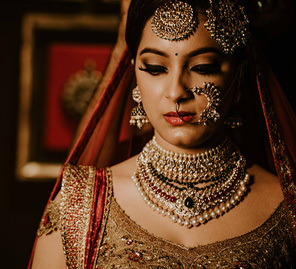 I wanted a bridal look but not something that would overpower my features, and Jasmeet gave me just that." "My only advice for brides is to enjoy the process. Don't get so caught up in the planning that you don't enjoy the little things in life that give you happiness. Delegate work to people you trust, because honestly, you need just enjoy these best days of your life without worrying about anything. One last and very important thing, don't do anything over the top. Just be your happy self, and you will make the prettiest bride ever. "